Tag Archives for " brookville "
Focus Insurance Services has a new website! With offices in Osgood, Portland, and Cambridge City, Indiana, Focus Insurance Services provides Life and Health insurance to local communities. 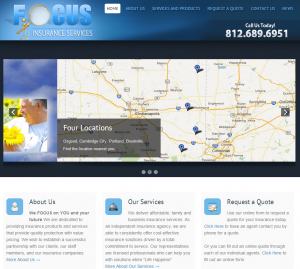 Our "Focus" was to give Focus Insurance a new look and updated visitor engagement tools such as social buttons, a blog for news updates, and a quote request form. If you are in the Cambridge City, Portland, Brookville, or Osgood, Indiana areas, contact the pros at Focus Insurance to get a quote or update your insurance coverage today!